It's official! 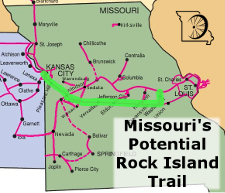 Rock Island Trail on track to become second cross-Missouri trail - making a 450+ mile interconnected trail system! It's official! Ameren has submitted a letter indicating its plans to railbank 145 miles of the Rock Island line stretching from Windsor almost to Washington, Missouri, where it will eventually connect with the Katy Trail. With existing Katy Trail and portions of the Rock Island Trail already underway, that means Missouri will have an interconnected statewide trail network of over 450 miles. This is a historical event for Missouri--an announcement whose impact will be as large as when the Katy Trail was first announced in the late 1980s. Most states don't even get the opportunity to create one major cross-state trail. Now Missouri is building two interconnected cross-state trails. The opportunities for tourism, recreation, and economic development along the entire Rock Island and Katy Trail corridors are tremendous. Communities along the route have been working to turn the Rock Island corridor into a statewide trail since the 1980s, when the Rock Island Railroad last saw traffic. The corridor almost became a trail in 1993. It has taken another 21 years of waiting and work to make the trail a reality. Kudos to all the communities and partner organizations who worked to make the Rock Island Trail announcement a reality today--including MoRIT--the grass roots coalition of Missouri Rock Island Trail communities, Missouri State Parks, and the national Rails-to-Trails Conservancy, whose assistance and support this summer was vital in making today's announcement possible. 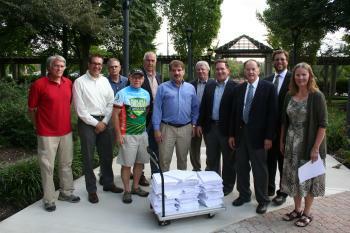 Representatives of MoBikeFed and MoRIT meet with Ameren to deliver petition signatures in support of the Rock Island Trail. The Rails-to-Trails Conservancy played a key role in promoting the trail, helping build nationwide support, and in submitting a competitive bid to purchase the corridor. 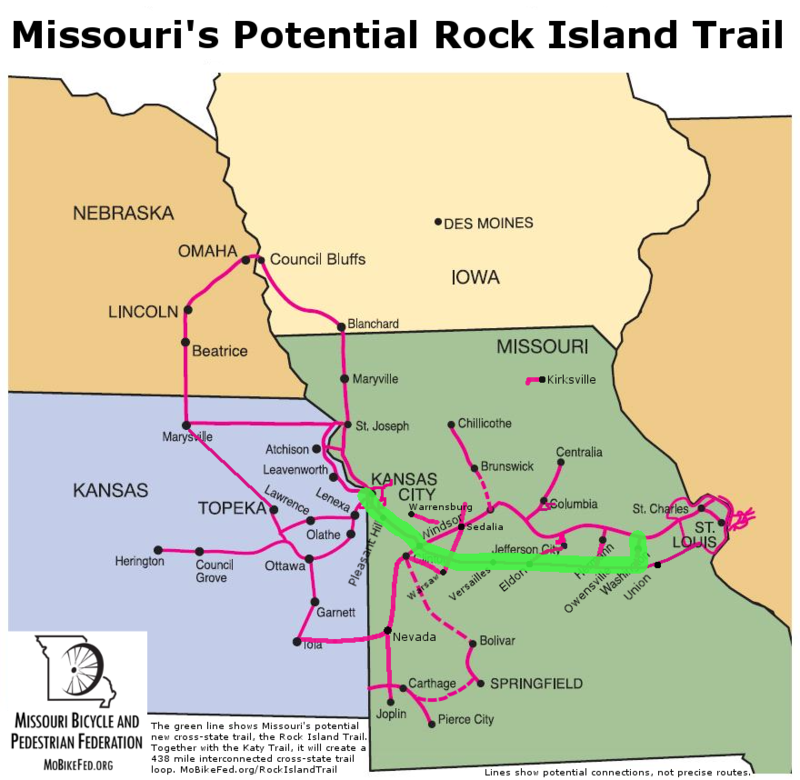 MANY thanks to everyone who signed the Rock Island Trail Petition - over 12,500 people signed that petition and it was very important in showing high public interest in the trail to Missouri State Parks, to the Governor, and to Ameren. Everyone wanted to do the right thing in this situation, and help make a trail. But when they understand that their is solid public support behind them, doing the right thing becomes a lot easier. What does the future Rock Island Trail network look like? 143.7 miles - Rock Island, Windsor to Beaufort (near Washington) (State Parks). This is the segment Ameren committed to railbanking today. 47.6 miles - Rock Island Pleasant Hill to Windsor - result of the Taum Sauk settlement with Ameren (State Parks). This segment was railbanked earlier this year and salvage work/trail construction is currenctly underway. There is another small segment of trail about 0.6 miles, through and near Pleasant Hill. 24.8 miles - Rock Island Pleasant Hill to KC, currently in negotiations for purchase from Union Pacific (local municipalities). Jackson County Executive Mike Sanders announced a preliminary deal to purchase this segment earlier this year and he recently announced that work is progressing to finalize the deal. Perhaps the momentum of the new 144-mile addition to the eastern end of the Rock Island Trail will provide momentum to finalize negotiatios on the western end as well. This is 24.8 miles per this STB docket. When the new Rock Island Trail segments are complete, that will rocket Missouri to the forefront of states with long, interconnected trail systems. 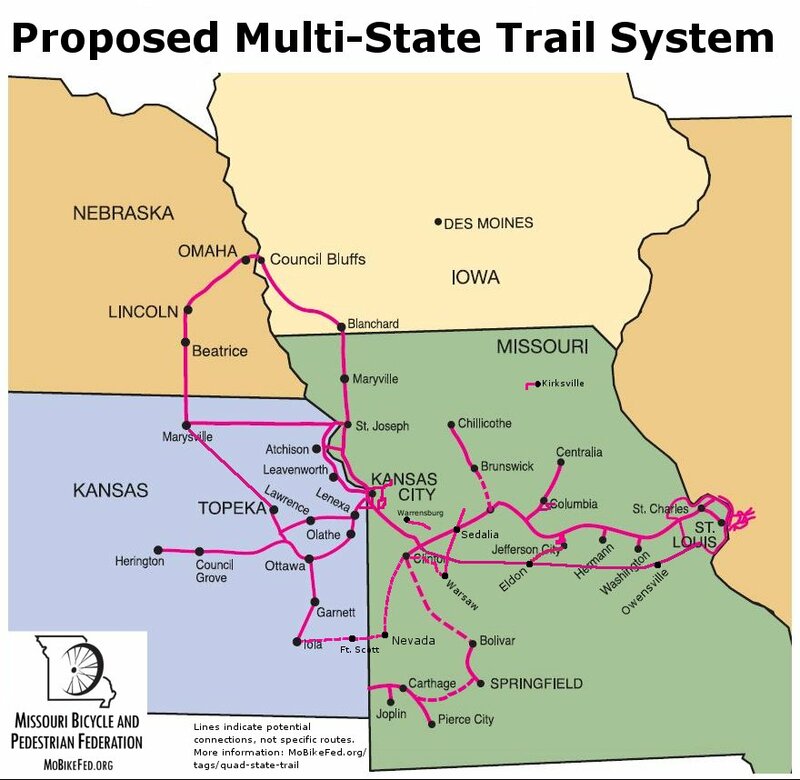 With the addition of major planned trail systems in the St Louis, Kansas City, Columbia, Springfield, and other areas of the state, the state's trail system starts to look formidable indeed. Earlier this summer, Ameren unexpectedly announced that it was taking bids to sell this portion of the Rock Island line. MoRIT, the coalition of citizens in the Rock Island corridor communities, quickly mobilized to contact Ameren to ask for an opportunity to bid on the line. MoBikeFed and the Rails-to-Trails Conservancy worked with trail supporters across Missouri and across the U.S. to mobilize support for the trail option and for the opportunity to bid. The Rails-to-Trails Conservancy then worked hard to submit a viable bid to purchase the line in time for Ameren's deadline in late July. We were very concerned that if Ameren were to sell the line to a salvage railroad, the opportunity to railbank the corridor could be lost forever--or at best, delayed by decades. The Rails-to-Trails Conservancy's bid gave Ameren the opportunity to sell the corridor, if that was the business direction they wished to take, while still guaranteeing that the trail conversion would occur at the end of the process. In the end, it appears that Ameren has elected to retain the key portion of the line, from Windsor to Beaufort and to railbank it directly--rather than selling to a third party. At this point, that is the best possible outcome for the trail option. We applaud Ameren for taking time to carefully consider the options and, in the end, taking the option that will best benefit Ameren stockholders and customers, as well as the citizens of Missouri, in retaining this portion of the corridor to railbank it and transfer the corridor to Missouri State Parks to become part of the new Rock Island Trail State Park. 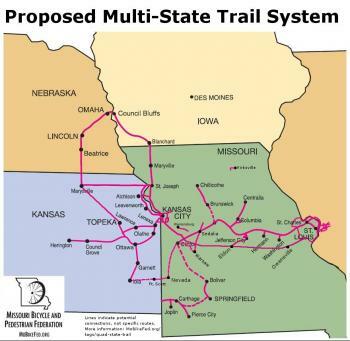 Missouri State Parks, with the strong support of Governor Nixon, has also played a vitally important role in bringing the Rock Island Trail to this point. Because Missouri State Parks built a strong, ongoing relationship with Ameren as they negotiated to railbank the 47.6 miles of Rock Island corridor between Pleasant Hill and Windsor, Ameren now feels comfortable in moving forward on a similar basis to railbank the next 145 miles--creating a second cross-state trail in Missouri. In addition, and very important: Missouri State Parks is willing to take on the large and amazing new trail as a new state park. It is not often a state is presented with an opportunity like this, and we must applaud Missouri State Parks, the Missouri Department of Natural Resources, Governor Nixon, and other local, state, and national politicians and decision-makers involved for having the vision to support this major new trail in Missouri. How long will it take before we see a trail on the Rock Island line? First off, the letter Ameren issued today is simply the first step in its work to railbank the line. There are many more steps and hurdles, many of them complex and with the potential to throw the project off course. STEP #1: Railbanking. This is a complex legal process. Railbanking previous portions of the Rock Island line has taken 12-18 months minimum. So we will need to be vigilant to ensure that the railbanking effort, which is likely to take 1-2 years, stays on track. STEP #2: Salvage. The rails and equipment will need to be salvaged. This is the step much of the 47.6-mile Rock Island segment from Pleasant Hill to Windsor (the Katy Trail Connector) is currently on. Experience says salvage work will take 12-18 months, minimum--and perhaps more if difficulties are encountered. We understand that Ameren has agreed to remove all of the rails (which are valuable) and also has generously agreed to remove the ties (which are not), as part of the salvage process. That should leave a majority of the line cleaned up and ready to be rather easily converted to trail use. STEP #3: Trail building. Finally, there is the trail construction itself. Keep in mind that it took a decade before the majority of the Katy Trail was usable, and Missouri State Parks continues to add sections after more than two decades of use. We should see selected sections of the trail come online soon after salvage work is complete--optimisticaly, within 1-3 years. It may be a decade or more before we see a complete trail running from Windsor to Beaufort--and then linking up with the Katy Trail near Washington. The Rock Island Corridor has some potentially difficult spots--a couple of major river bridges, including a very long bridge over the Gasconade River, and a couple of tunnels. These will be major scenic attractions of the trail when complete--but may require time and signficant funding to fully integrate into the trail. What we are likely to see first is small sections of the trail near populated areas completed, then gradually connected across the state--much as we saw with the development of the Katy Trail. We may see long sections of connected trail develop, then just a couple of trouble spots holding the trail from completion, and finally--perhaps after decades--a final connection all along the line and through to the Katy Trail near Washington. Good news is that work in the 47.6 mile section from Pleasant Hill to Windsor (where the Rock Island makes a connection with the Katy Trail) is already underway. Legal work there is complete and the line is railbanked, as of early 2014. Some salvage work on this section is complete, and even some trail and trailhead construction is complete. We could see portions of the 47.6-mile segment open soon, and work completed on the 47.6-mile Katy Trail connection segment finished within a few years. By the time the 47.6-mile Katy Trail Connection segment is open for use, we may see portions of the 145-mile Windsor-Beaufort starting to come online. Altogether, a truly exciting time for Missouri trails, as we see the beginnings of another cross-state trail of the magnitude of the Katy Trail come together. Rock Island Corridor - Ameren is now proposing to railbank the sections 71.6-215.325 and 262.906-263.5. Section 215.325-262.906 (Windsor-Pleasant Hill) is already railbanked and under construction as a trail connecting the Katy Trail to Pleasant Hill. Click the image to view the full-sized version. One of the top goals of MoBikeFed's Vision for Bicycling and Walking in Missouri is building a world-class bicycle and pedestrian transportation system in Missouri. The addition of the Rock Island Trail to Missouri's statewide trail system is the biggest single advance we have seen in Missouri in over 20 years. Your membership and generous financial contributions help turn our Vision into reality--building the statewide public support for bicycling, walking, and trails that make major advances like the Rock Island Trail possible.